Varicose Veins are caused by the blood in veins (usually, but not always) from lower limbs of the body failing to flow back to heart because of the poor or damaged condition of the leaflet valves in the veins (valvular incompetence), exacerbated by standing, sitting or maintaining a particular position for a long period of time. Pregnancy can also initiate varicose veins to develop. The blood remaining in the veins causes swelling and is known as “varicose”. Usually the superficial veins will be noticeable at first, often referred to ‘spider veins’. Larger varicose veins cause noticeable swelling under the skin. Examine your legs for any of the conditions below: Purplish to dark greenish spots or twisting lines (veins). If you have any symptoms) of or suspect you may have varicose veins (purplish to dark greenish spots or twisting vein lines), we recommend that you contact your doctor. The wearing of compression socks and stockings is well recognized as being an effective countermeasure against the development and/or spread of varicose veins. 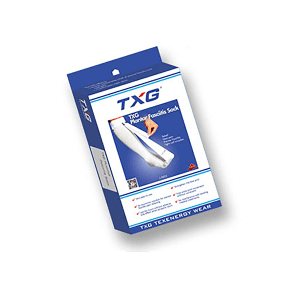 All styles of TXG Graduated Compression socks are suitable for varicose vein prevention/treatment. The level of compression you require should be considered with your physical status. Please refer to our compression guides or check with your Doctor if you are not sure what compression level is best for you.